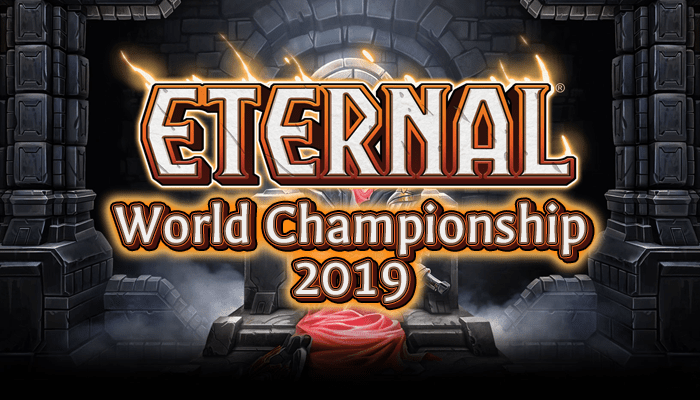 One of the great features of Eternal is a robust single-player mode with a fairly clever AI and a bevy of interesting decks. For experienced CCG players, these modes can be a great place to stick your feet in and test new decks and drafting strategies. For people new to Eternal and new to card games in general, Gauntlet is a training mode – a place to learn and challenge yourself, and to build your collection up without getting beat up too much. Either way, Gauntlet is an excellent place to start when you’re getting set up in Eternal – so let’s talk about how to do that optimally. The Gauntlet is a single player mode using constructed decks – meaning, any deck you’ve built, you can bring in. You play against different decks, each one slightly stronger than the last, for seven games. Each game upgrades your prize by a slight amount, ending at 3 silver chests. These chests contain gold for packs and useful cards to expand your collection In addition, winning all seven games will upgrade the tier of the gauntlet and give you a bonus chest with two packs inside, each of which will contain 15 cards with a guaranteed rare or legendary. The last game of Gauntlet is a boss battle – a game with special rules to it that changes the flow of the game. Sometimes this buff will specifically benefit the computer, but more often it is merely a special rule that both players can take advantage of – like playing extra sigils every turn, or giving units random battle skills. The difficulty of the Gauntlet increases the more you play it. The AI gradually upgrades its decks, inserting better cards. The strength of its decks is based on three factors: your position in the gauntlet, the tier of the gauntlet, and the number of games you’ve played against the AI. You can’t (and shouldn’t) deliberately lose to reduce the difficulty, but the tiers will reset with each set released. While Gauntlet is a fun, casual mode for players who aren’t looking to get competitive, it also serves as an excellent practice yard for learning the basics. If you want to keep winning, you’ll need a deck that can reliably perform without being too dependent on the randomness of card games. First, you should have a reliable power base that will consistently net you the power you need. This is the hardest thing for most new players to learn. A typical deck will have 25 power plus enough additional power-finding cards to make up around 29 power sources. In other words, when in doubt, put 4 Seek Power in your deck at a minimum! If your deck is low to the ground and doesn’t play drops above five, you can manage around 27 sources, but if your deck wants to hit anything at 8 you’ll probably want at least 32. Second, your deck should have a good distribution of units to other spells and attachments. Unless you are geared up for a specific style, you should be running between 20-30 units (typically, 24 is a good average number). Third, your deck should have a good curve to it. That means a lot of low power cards – at least 12 two-power drops, for example – and a decent distribution of cards at numbers 2-4, slowly winding down into tiny amounts between 5 and 8. An unreliable curve is a second common reason new players have power issues early in the game. In general, it’s better to run 4 of any one particular card that you like, as that increases your chances of drawing and playing it. This isn’t as true if the card is a high-cost finisher that you don’t want multiples of in your hand – having four Channel the Tempest on turn three is an awful situation! This is all general deckbuilding advice. One final tip against AI in particular: you should heavily favor fast spells that buff units or kill enemy units, because: tricks! One of the things that the Eternal AI is purposefully very bad at is reading cards in your hand. It will always, always fall for what we call combat tricks – fast spells and ambush units that can be played to alter the course of combat. You should stack high on these types of cards to abuse the AI where you can. Rapid Shot, Finest Hour, Annihilate, even cards like Synchronized Strike can very heavily alter the flow of a combat. For example, if you attack with a 6/6 into two 4/4s, the AI will of course block with both, even if you have open green open. This turns your Finest Hour into a 2 for 1 card advantage card, where you spend one power to turn your 6/6 into a 9/9 and kill both units! Remember that there are many cards that can leverage this weakness – a card like Annhilate will pick up one of the 4/4s after blocking occurs and leave the 6/6 to eat the other one for free. Stun cards like Flash Freeze will remove blocking cards from combat, disabling multiple blocks and again allowing you to crush the remaining defenders. Every time you see a card with a fast effect, think very carefully about how it can affect the flow of combat and change a fight in your favor. Most of these tricks will also work on human players, although the higher their skill level, the more likely they are to read a trick in your hand and try to play around it. Even so, if the potential gain of you not having the card they think you have is worth it, they may not be able to resist! The Eternal AI is actually really grand – not at the subtler elements of gameplay, like bluffing or subterfuge, but at the ability to play the optimal line with whatever information it currently has. It doesn’t cheat (on card draws or otherwise), it never knows the contents of your hand, and it is persistent at pressing advantages and picking good trades. As such, it is a strong teaching tool for good habits in Eternal. There are things you should learn from the AI: primarily combat related decisions, such as how to use multiple blocks to turn negative situations into positive ones. For example, the AI knows to stack two 4/4s up against an attacking 6/6 so that one of each of your units dies. It also knows not to attack with a 4/4 into two 3/5 units, even though neither unit can kill the 4/4 on its own. Eternal players will get to know the double block extremely well – better than most Magic players – and it’s one of the more immediately important skills to have picked up by the time you’re playing against humans. You’ll also notice the AI will usually hold back its units from attacking into bad trades – unless it has a way to push enough damage to win the game. This is a crucial decision point that is not always easy to math out – pay attention to these situations and think about whether you’d be wise to make the same choice. Whenever you see the AI make a decision that seems strange to you, consider the information it has available – your board state, the contents of its hand, and its board. Chances are there’s a very good reason that it is making that decision, and understanding that reasoning even when it is wrong will help you to make better decisions in the future. Follow the AI to learn optimal lines of play – but bluff it to turn those lines into disasters. One other skill to pick up is reading the AI’s hand. Remember that the AI doesn’t bluff, and it doesn’t make uninformed decisions. If it attacks into your 5/5 with a 4/4, you can guarantee that it has something like a Finest Hour in its hand. In other words – if you see the AI do something monumentally stupid, try and guess the card in its hand that makes it smart, and decide what to do based on that information. This is also the first step to learning to read real humans’ hands! Learning this type of guesswork will really help you out in the long run. Don’t worry about immediately getting yourself up to those 4x Sandstorm Titans – the key thing to be worried about starting out is getting a base set of uncommons and rares that you can use to make up the core of your decks. You want to side out underwhelming cards like Forge Wolf and Back Alley Bouncer that behave unfavorably and replace them with more stock cards like Oni Ronin and Steward of the Past. It’s recommended to start building hybrid decks as soon as you are able. If you are looking for specific decklists to get you started, you can check out the Eternal Basics series, which offers cheap lists in every color without using rares or legendaries. That concludes our basic advice on Gauntlet. If you’d like some decent lists that will perform well in early Gauntlets, I recommend checking out my Eternal Basics series on Youtube for cheap lists that use only commons and uncommons. Next up, we’ll talk about Forge and some of building decks from a limited pool. See you then!